With the ink barely dry on his debut UK release, those fans who feasted on HIGH TOP MOUNTAIN are set to gorge themselves further as Sturgill Simpson’s sophomore album METAMODERN SOUNDS IN COUNTRY MUSIC simultaneously hits both sides of the Atlantic on May 12. Having caused more than a ripple within the country music intelligentsia with his first album, Sturgill serves up more of the same in this follow up which further justifies UK label Loose Music’s decision to add the Kentucky born country outlaw to their roster. You are unlikely to come across a deeper and more philosophical album this year as Simpson continues to delight those seeking for an heir to Cash, Nelson, Haggard and Jennings. With masterly song writing and a neo traditional stance, this album oozes with a pretence soaked in top 40 radio antipathy. This is country music with a psychedelic edge that manages to push your mind to the limit and at the same time still retain glimpses of a laid back sound synonymous with the golden age of classic singer song writing. This contrasting observation is epitomised in the opening and closing tracks which book-end this 34 minute ten song collection. Quite what the Grand Ole Opry made of Simpson bringing the high-brow thinking of the earth being pulled along the universe on the back of a turtle to its iconic platform is unsure but the opening and lead song from the record has all the structural hallmarks of Kristofferson at his best. ‘Turtles All The Way Down’ is an interesting track designed to free your mind with killer lines such as ‘There’s a gateway in our mind that leads somewhere out there beyond this plane’ and ‘Met the devil in Seattle and spent 9 months inside the lion’s den’. The wider web will indulge any further analysis of this song but despite lacking a chorus hook it possesses a magnetic appeal and is rich in Simpson’s country vocals. For a more homely, nostalgic and fairly straightforward take on life, the album closes with a so called bonus track ‘Pan Bowl’ which sees Simpson in a reflective mood on his younger days. References to his grandparents are interesting as his grandfather is also the voice behind the album’s old style radio intro which sets the scene perfectly before we are introduced to turtle theories. The album’s second track is also another traditional pleaser and any country album is incomplete without reference to the content of ‘Life of Sin’. However Simpson is keen to not overdo the country clichés and virtually leaves the genre in his dip into a radical psychedelic sound within the strains of electric in ‘If It Ain’t All Light’. Simpson has chosen to rework the song writing of others on two of the tracks and decided it was time to recapture the truck as a means of living rather than a leisure lifestyle in ‘Long White Lines’. This song was popularised by 90s country star Aaron Tipping, angles on the lonely side of the trucking life and Simpson’s version does it justice. For his take on love, Simpson has rehashed an 80’s British minor electro-pop hit ‘The Promise’ by an act called When in Rome. He saw the country potential in the song and has certainly made a good job in re-working it in this style. There are gospel overtures to the guitar led rock n’ roll number ‘A Little Light’ , while ‘Just Let Go’ is a heartfelt ballad with traces of slide guitar adding to the ambience of the song. The two remaining tracks ‘Living The Dream’ and ‘Voices’ add to the diversity of the record with a underlying appeal of digesting the lyrical content amidst a sound true to the core of country music. Simpson is an acknowledged deep thinking artist and this approach is a defining feature of the album. 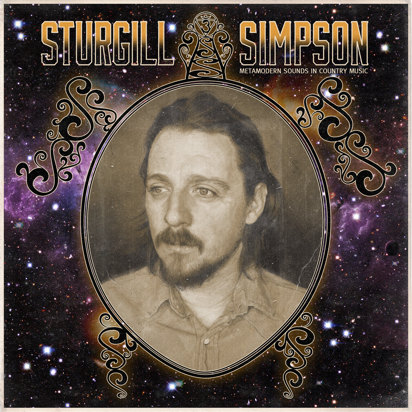 Simpson has once again teamed up with ace producer Dave Cobb (Jason Isbell, Lindi Ortega, Jamey Johnson) to bring the project to fruition and they have done a fine job in creating a piece of work of immense substance. METAMODERN SOUNDS IN COUNTRY MUSIC is an unrivalled album title and Sturgill Simpson is shaping up to be a likewise performer. This is set to be most analysed release of the year and once you tap into its thinking then the rewards will be unveiled.